The U.S. National Vegetation Classification (USNVC) is a result of a 20-year collaborative effort to develop a unified and consistent national reporting system for plant communities. As a collaboration between NatureServe, the Ecological Society of America (ESA), and federal agencies the USNVC is a reporting standard organized to reflect the functional ecology of plant communities. The organizing framework of the classification helps scientists speak the same language, whether to monitor vegetation of a particular site or conduct broad scale analyses of trends across the North American continent. NatureServe has worked with the U.S. Forest Service, U.S. Geological Survey, National Park Service, Bureau of Land Management, ESA’s Panel on Vegetation Classification and state Natural Heritage Programs to ensure the scientific rigor of the classification and facilitate the classification’s development. A peer view process for revisions and additions to the classification will be managed by ESA’s Panel on Vegetation Classification. The process is similar to those required for publication in scientific journals. 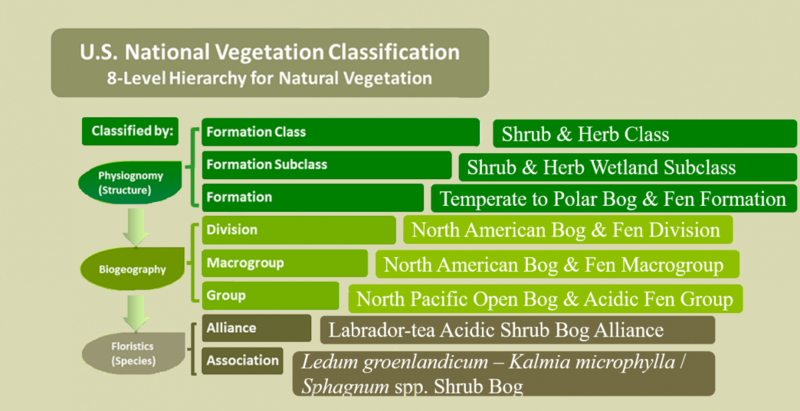 The top three levels (class, subclass, formation) of the USNVC are coarse-grained and describe major structural categories on a global scale, such as temperate forest, cold desert, and temperate grassland. The middle levels (division, macrogroup, group) reflect distinctive combinations of species in the context of regional to continental scale climate, geology, and water cycles, and disturbance patterns of fire, wind, and flood. Mid-levels include ecosystem categories familiar to ecologists, like Douglas-fir – western hemlock forest, hardwood-conifer swamp, or shrub-steppe. The combination of species largely defines the lowest, most fine-grained levels (alliance, association), distinguishing, for example, between Douglas-fir – western hemlock forests with an understory dominated mesic shrubs versus dry shrubs. The association is the finest unit of the USNVC and has been used by the Washington Natural Heritage Program (WNHP) as the primary focus for establishing ecosystem conservation priorities. The association is defined on the basis of a characteristic range of plant species composition, diagnostic plant species occurrence, habitat conditions and physiognomy. Associations reflect topo-edaphic climate, substrates, hydrology, and disturbance regimes. WNHP ecologists play a key role in the identification and development of association concepts for Washington State. This is accomplished this through synthesis of various vegetation classification efforts conducted within or applicable to Washington, as well as firsthand collection and analysis of vegetation plot data over the past 30 years. All of the existing information is synthesized with intent to produce a synonymized list of associations occurring in Washington. This process continues as new information become available. WNHP maintains a statewide database of associations and works with NatureServe to integrate these concepts into the USNVC. The list of USNVC vegetation types found in Washington can be viewed here, and detailed descriptions of USNVC Macrogroups and Groups found in Washington are found here. WNHP has modified the USNVC by developing a custom unit in the USNVC hierarchy called Subgroups. The Subgroup is a concept that aggregates associations (i.e., the finest-scale unit in the USNVC) based on similar primary ecological drivers such as landscape position, water source, soils, disturbance regimes and elevation. The Subgroup is used in lieu of Alliances which is the official USNVC level between Groups and Associations. Subgroups will allow WNHP to track the various ecological settings on the landscape while plant associations provide the ability to track the biotic diversity within those settings. To date, Subgroups have only been identified for wetland and riparian ecosystems. Future classification efforts will identify Subgroups for upland vegetation. Ecological Classification of Native Wetland & Riparian Vegetation of Washington In progress. F. Joseph Rocchio and Rex C. Crawford. USNVC Classification for Washington’s Ecosystems. Full hierarchy with Group Descriptions. 2016. NatureServe. San Juan Island National Historical Park Vegetation Classification and Mapping Project Report 2012. F. Joseph Rocchio, Rex C. Crawford, and Catharine Copass. Vegetation Classification of Mount Rainier, North Cascades, and Olympic National Parks. Plant Association Descriptions and Identification Keys 2009. Rex C. Crawford, Christopher B. Chappell, Catharine C. Thompson, and F. Joseph Rocchio. Riparian Vegetation Classification of the Columbia Basin, Washington 2003. Rex C. Crawford. Plant Associations of Balds and Bluffs of Western Washington 2006. Christopher B. Chappell. Upland Plant Associations of the Puget Trough Ecoregion, Washington 2004. Christopher B. Chappell.